Ever since the invention of the motor vehicle, men have been obsessed with cars. Not only do they ease the effort of transportation, they also feature creative design and performance elements that resonate with men. It’s pretty obvious that the car industry, from manufacturing to racing, is dominated by male figures. Coincidentally, a love of cars tends to mix with a love of tattoos, and many motor heads sport car-inspired ink. Many men are fascinated by vintage cars and the beginning of the automobile industrial revolution. Vintage cars were built at least 30 years ago, and they represent the birth of a world changing industry. Men who get tattoos of vintage cars are likely to have childhood connections with some of the earliest makes, so their tattoos represent something that inspired them from an early age. This style of tattoo can also indicate a strong attraction to a certain year or decade in the past. For example, the 1950s and ’60s were full of iconic car designs such as the Volkswagen bug and van. These cars symbolize an era of hippy activism and utopian ideals. Car tattoos for men also come in the form of race cars. Car racing is one of the most popular sports in the world. Die hard fans are known to get tattoos of their favorite race car. This type of tattoo represents a love for high-speed thrills and appreciation for talented drivers. Instead of getting a whole race car tattoo, some men opt for just the number of the car or the maker’s symbol. 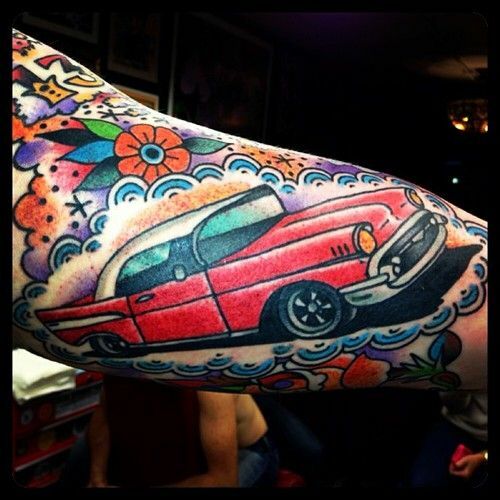 Race car tattoos also incorporate popular muscle cars. 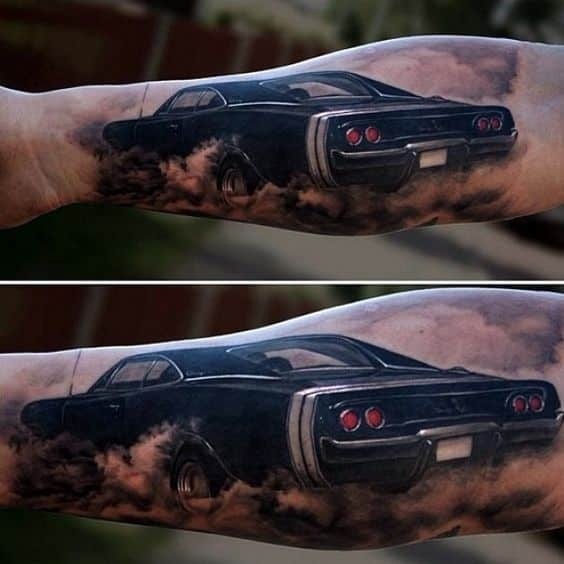 American men are well-known for their appreciation of American muscle cars, and getting a tattoo of a favorite model is a great way to symbolize loyalty to that vehicle. There are dozens of movies and TV shows that feature famous rides. Examples include The Dukes of Hazard, Ghost Busters, Herbie and Grease. Cars from pop culture often show up in tattoo form, and the wearers of these tattoos are dedicated fans. These tattoos are great conversational pieces as they relate to other die hard fans. This kind of tattoo is for the science fiction junkie. For some men, the love of vehicles and technology combine into an imaginative tattoo featuring never-before-seen design elements. Science fiction inspired car tattoos for men indicate an appreciation for innovation and doing the impossible. Many men collect or re-build cars as a hobby. Serious car collectors and builders frequently get exact representations of their own favorite car tattooed on them. A man’s favorite vehicle can say a lot about him and this type of tattoo is a statement of car love and an expression of personality traits. For example, men who like fast muscle cars are usually outgoing and love to partake in adrenaline-filled activities. Whereas men who like luxury cars are often more reserved and appreciate the finer things in life. Additionally, men are sometimes forced to sell their favorite car or the vehicle was ruined in an accident. Getting a tattoo of a lost car helps keep the memory and love alive. 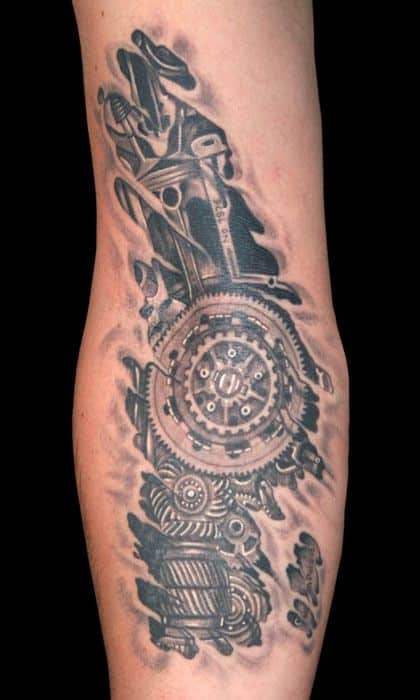 This black and white car tattoo design features a series of highly detailed gears and car engine parts. 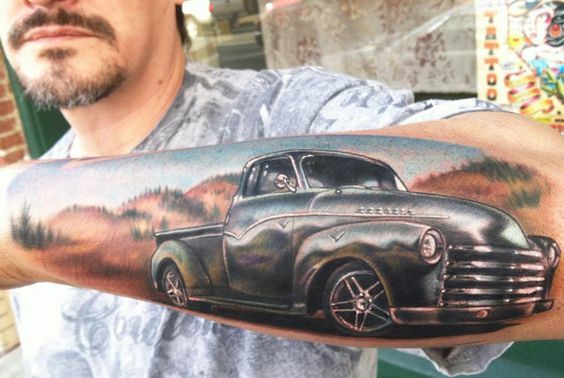 Perfect for smaller areas like the forearm, this car tattoo idea makes excellent use of shading and uses several different hues of black ink to create an edgy look. The ink is highly saturated with deep black at the center of the tattoo and fades to lightly smudged black ink at the edges. This image features a vintage race car in black and white accented by vivid red and blue lines which give a distressed look. 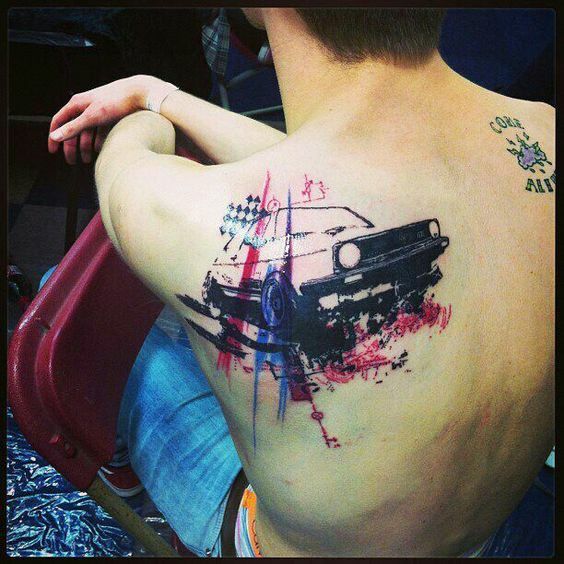 Complete with a checkered flag in the background, this is one of the best car tattoos for guys who are looking for a smaller tattoo with a grungy, distressed vibe. One of our most realistic car tattoos for men, this design shows a vintage silver truck in a sandy, desert-like landscape. The shiny silver hue of the truck is contrasted by the detailed greenish-brown grasses and hills in the background. Above the scene, a dusky blue sky completes the image. 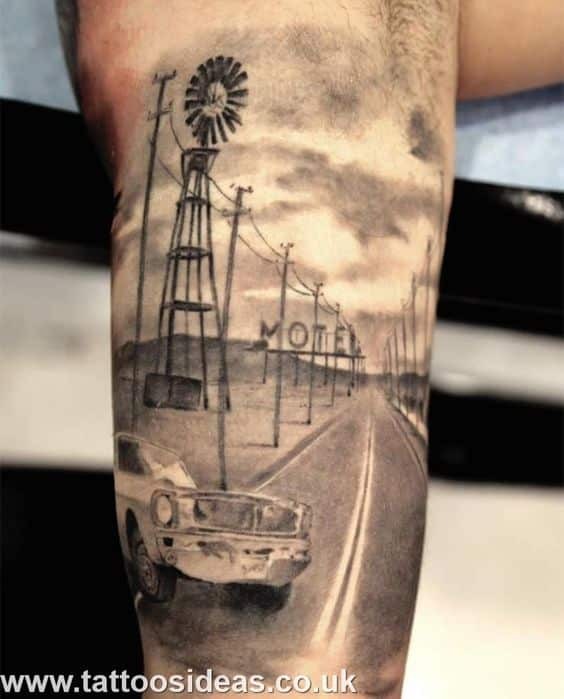 Depicting a vintage black car gliding down a dusty road, this is one of our most distinctive tattoo ideas for men and would be perfect for guys who want a tattoo for medium sized areas like the forearm. The inks used in this tattoo are particularly vivid. The shiny black of the car is offset by the clouds of dust coming from the road. The dust clouds make artful use of smudging near their edges and give a sense of motion to the design. 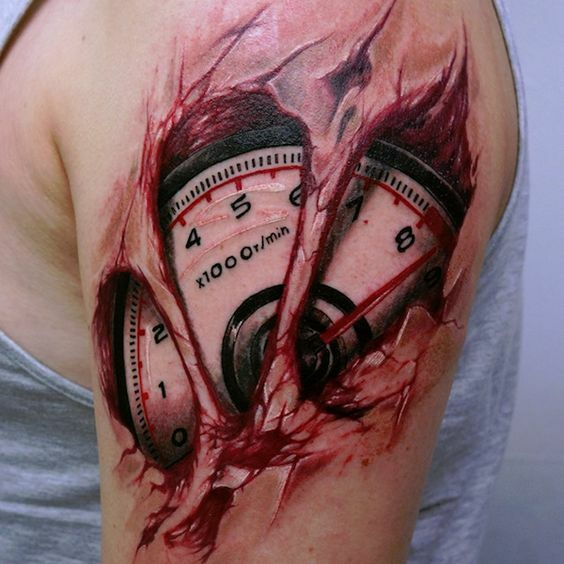 Offering a different take on racing equipment, this car tattoo shows a retro odometer in black and white with a red needle. It appears to be encased by 3 very realistic pieces of skin which overlap it and come together at the bottom of the design. This car tattoos idea is a great option if racing is in your blood! Ideal for medium sized areas, this dusty black and white tattoo harks back to the good old days of driving on the open road. It illustrates a vintage car turning onto a 2-lane road with a windmill and a retro motel sign in the background. Power lines along both sides of the road add structure, while gray, floating clouds are gently smudged towards the top of the image. 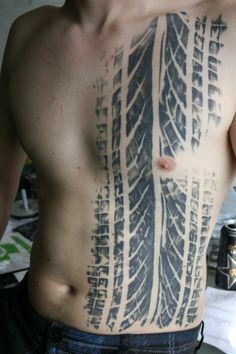 If you love car tires, this tattoo design is for you! Covering the entire left side of the torso, it features intricately-detailed, highly-realistic car tire tread which is lighter on the outside of the image and gets darker towards the center. Slightly asymmetric in style, it comes up a bit higher on the right side of the image and dips a bit lower on the left. Patches of white are left on the side of the image to enhance the realistic and distressed feel. This cool design is great for larger areas and showcases a shiny silver car part highlighted by a dark blue cord that gently winds its way down from the top to the bottom of the image. Dark red, smudged shadows provide a stylish background. The focal point of this image is the classic red convertible with its white top. With hazy blue tinted windows and orange circular headlights, the car is surrounded by a blue and white semicircle motif and accentuated by a red flower at the top of the design. 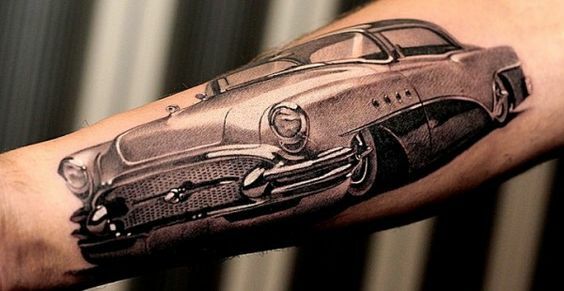 This realistic black and white tattoo features a silvery-gray vintage car with an intricately detailed grill. The ink is used to give the car a shiny appearance, and you can even see a light reflecting off the window glass. This tattoo design is a good choice for small to medium areas.